There are some stories that catch you off guard…because they’re so remarkable. That can be said of the story from vocalist Greg Keelor, of the great Canadian band Blue Rodeo. 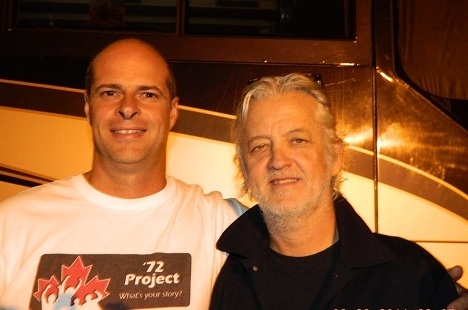 After mentioning what the ’72 project was all about, I asked him if he was a hockey fan. “Yea, I like hockey”, he said casually. I had goose bumps listening to that story and I sensed that Greg probably hadn’t spoken of that magical moment for a long time. To learn about where Greg was when Paul Henderson scored his goal, you’ll have to stay tuned and read about Jim Cuddy from Blue Rodeo’s story. While I’ve always enjoyed listening to Blue Rodeo, that story will bring an added smile to my face. This entry was posted in Featured Stories, Stories and tagged Blue Rodeo, Bobby Orr, Frank Mahovlich, Maple Leaf Gardens, Ontario, Toronto. Bookmark the permalink.